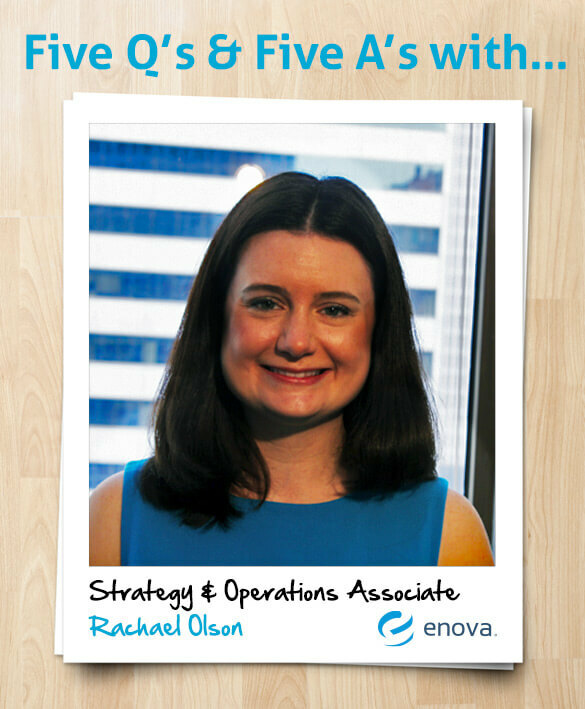 Getting to Know: Strategy & Operations - Enova International, Inc.
My route here was pretty circuitous. I started my career in financial services operations at Morningstar, earned my MBA part time while working full time, moved into investment consulting, and then finally into economic consulting. But after a few years of consulting, I really missed building things and watching them get implemented. I reached out to my network of MBA classmates, and one of them told me about Enova. I’ve been here a little over a year now, and I’m so glad I came. I’m a Strategy & Operations Associate. I spend about half my time working on day-to-day issues, such as estimating our future staffing needs or improving processes. I spend the other half of my time building new strategic initiatives for CashNetUSA. Recently I did a competitive analysis project, which gave me a few big ideas! S&O works closely with our call center, which is based here in Chicago and in Gurnee. Because they deal directly with our customers, we get really good insights from them, and we know almost instantly whether our projects have been well-received. The culture, which is made up of amazing people. Everyone is extremely smart, and we all work in a very fast-paced, exciting environment. Enova encourages its employees to take on a lot of responsibility, so you have every opportunity to make a big impact. Hawaii. My husband grew up there, and we go at least once a year to visit his family. The weather and food are both beyond amazing, and the people are incredibly nice and laid back. 1. My e-reader! I love reading, and it’s packed with 1,500 book titles. It’ll last almost a month without a wireless connection. Hopefully I won’t be stranded longer than that. 2. An “emergency survival kit” complete with fire-starting gear, water purification tablets, etc. Amazon apparently sells them, so I’m going to count this as just one item. 3. My eight-year-old miniature pinscher, Toro. He’s a great little watchdog and he makes me laugh.